As published in the LA Weekly on 6/20/13. Tickets available here for our final two performances this coming Thursday & Saturday. Read the review below or on on the LA Weekly Website here. 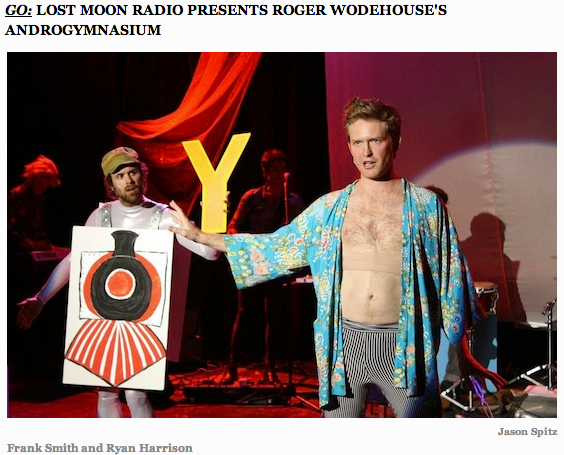 This entry was posted in Blog, News, Press and tagged "Hollywood Fringe", "Roger Wodehouse", 2013shows, LA Weekly, Lost Moon Radio, Lost Moon Radio Presents "Roger Wodehouse's Androgymnasium", review, show review on June 25, 2013 by wmaierica.